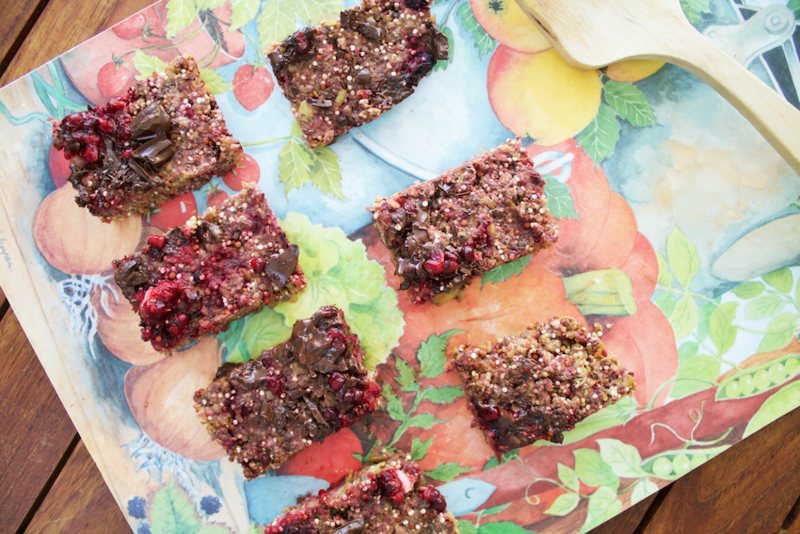 QUINOA AND BERRY BREAKFAST BARS | RAWR BOWS. You know when you feel the need to bake something for no apparent reason? Well, that happened to me the other day. I tried to find some cool recipe on the Deliciously Ella app that I talked about on a recent post but my pantry seemed to have a serious lack of ingredients. Thus, I created my own recipe inspired by the Chia, Quinoa and Banana Granola Bars from Ambitious Kitchen. The bars turned out amazing and were gone in a day, they were really filling and tasty so I'm definitely gonna make them again soon! They are great to have for breakfast with some tea or coffee, as a snack in-between meals or even as a healthy dessert. 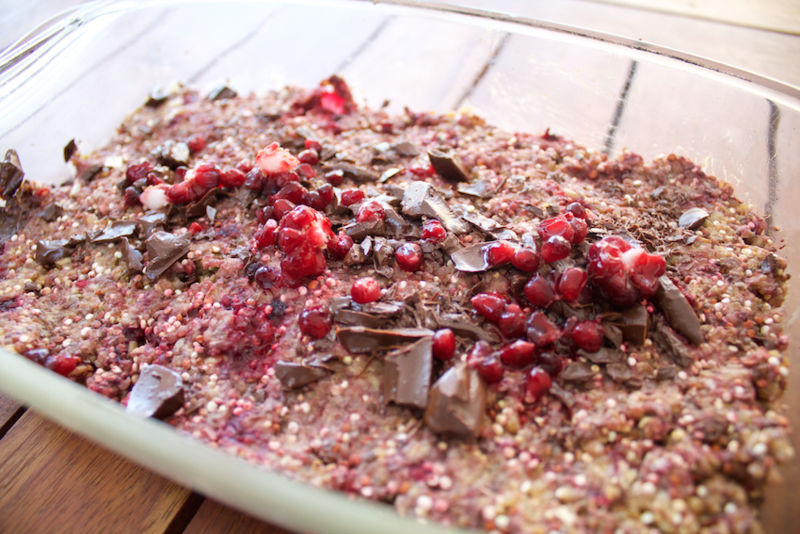 Start by mixing the oats, quinoa and chia seeds in one bowl together with the salt and the cinnamon. Use a blender to transform the apple into puree and add it to the bowl. Add in the maple syrup, olive oil, vanilla extract and the natural yoghurt. Once everything is evenly mixed break the frozen raspberries into small pieces -put them in a closed plastic bag and smash them - and add it to the mixture. Stir everything together and put the mixture in a greased pan and press down until the top is flat. Bake it in the oven for about 20min at 180 degrees celsius. 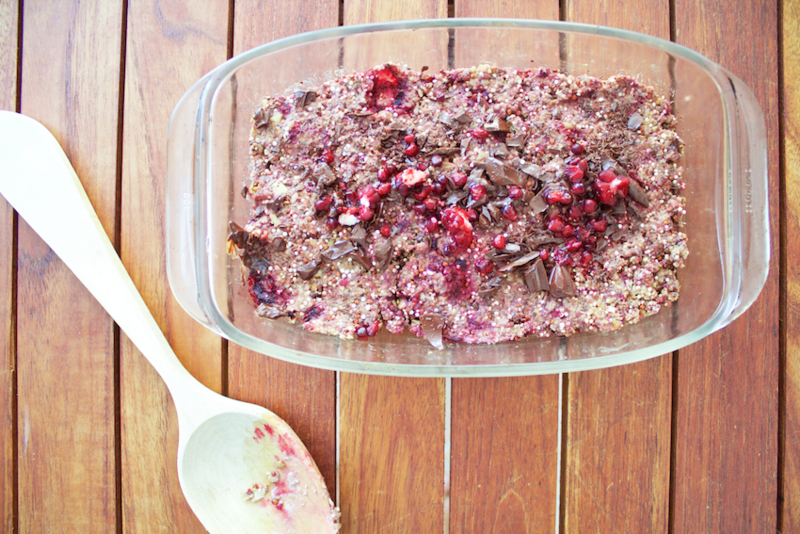 Leave it to cool for about 10min and sprinkle some frozen raspberries pieces and dark chocolate on top. Cut it into 8-10 pieces and it's ready to eat! They are really easy and quick to make so if you want to try something new I would give these a go! Let me know if you decide make them!